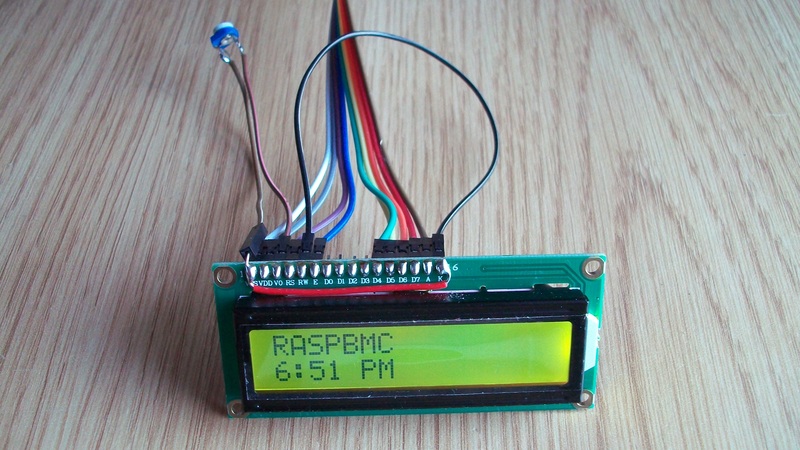 This is an inexpensive way of providing visual output for a Raspberry Pi media centre. It lists the track title and artist when playing mp3’s for example, and could be used when the media centre is controlled by an android remote but no RCA or HDMI screen is connected. AndyPi sells a complete kit of parts, including the LCD, wires & contrast adjustment potentiometer. The installation instructions below are given step-by-step, and requires no additional knowledge. Advanced users please note this replaces some XBMC configuration files, see part (5) for more information. 1. Install RASPBMC to your Pi’s SD card. Look here for instructions http://www.raspbmc.com/download/ for installation from Windows / Mac / Linux. 2. Start up your RASPBMC, Go into the “System” menu on the far right, go into “System” and in “Video output” click the check box to “Enable LCD/VFD”. UPDATE JUNE 2014: – Note from XBMC v13 onwards, this checkbox has been removed. To enable LCD support in XBMC, you need to install an add-on through the XBMC repository instead (Note if you do this with older versions which still have the checkbox, you MUST disable it – only use the checkbox OR the add-on, not both).Get it from System > Add-ons > XBMC add-ons > Services > XBMC Lcdproc.